Little Samuel Drew is off for a walk with his dog-on-wheels. Past the busy people on London's streets, past the pub, the market and the man selling balloons--onto a double decker bus for a trip to London Zoo. There's cheeky chimps, sliding penguins, sleeping snakes and snoring tigers, but what Samuel really wants to see ... are the possums. The only trouble is, the possums are sleeping. Samuel waits, but alas, the possums sleep on, so Samuel turns to leave. Unbeknown to him, as he turns to go, some little fluffy friends hop on for the ride. This is a simple but adorable tale. 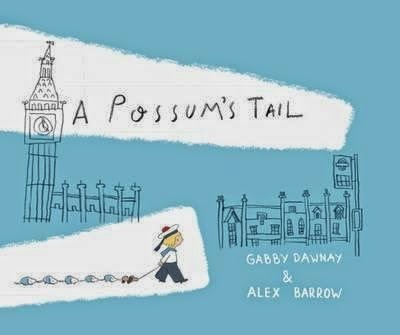 Kids will love shouting out 'look behind you' in that pantomimey way, as Samuel tugs his little string of possum friends along in a charmingly clueless way. Divine, retro-esque illustrations splashed across creamy, matte pages make the book a visual delight, with superb street and aerial scapes of London Town.